From : Arthur Eli Monroe, Early Economic Thought, (Cambridge, 1923), pp.336-348. 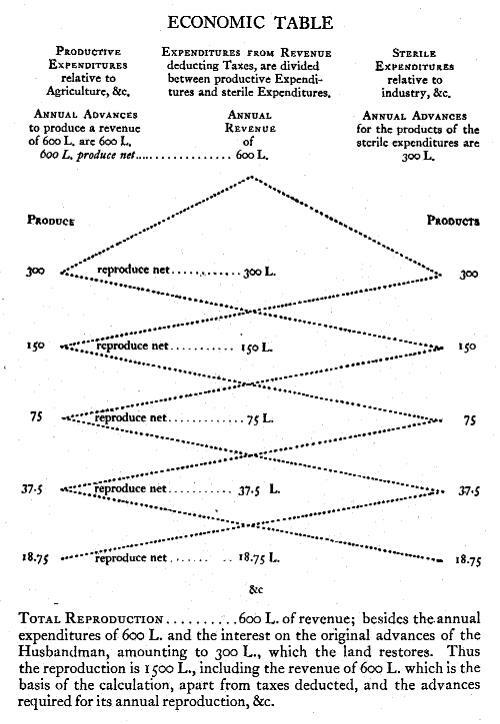 The 300 livres of revenue which were devoted to productive expenditures in the table bring back to this class, in money, advances which reproduce 300 livres net, which make up a part of the reproduction of the Proprietor’s revenue; And by the distribution of the remaining sums which return to this same class, the total revenue is reproduced yearly. These 300 livres I say, which return to the productive class at first through the sale of the products which the Proprietor buys of them, are spent by the Farmer, half upon the consumption of products furnished by this same class, and the other half upon clothing, implements, tools, etc. which he buys of the sterile class. And they arise again with the net product. The 300 livres of the Proprietor’s revenue which were devoted to sterile expenditures are spent by the artisan, half on productive expenditures in the purchase of subsistence, raw materials, and for foreign commerce; the other half is distributed among the sterile class itself for living expenses, and to restore the advances. This circulation and this reciprocal distribution continues by subdivisions in the same order, down to the last penny of the sums which pass reciprocally from one class of expenditures to the other class of expenditures. The interest on these advances should amount to at least 10 per 100, for the products of agriculture are exposed to ruinous accidents, which in ten years destroy the value of at least one year’s crop. These advances demand, moreover, much up-keep and renewals; hence the total of interest on the original advances for establishing the Husbandmen is 333, 322,000 livres. The total annual reproduction in net product, in annual advances with the interest thereon, and’ in interest on the original advances, reckoned in conformity with the order of the table, is 2,543,322,000 livres.